Our Community Relations Department is your conduit to news and information about happenings at War Memorial Hospital. Find links to the latest releases, newsletters, and our photo/video gallery on the left. Watch our Facebook page for announcements and other new content as it becomes available. Find us on Facebook at facebook.com/WarMemorialHospital. Would you like to help shape healthcare services for patients and families in your community? 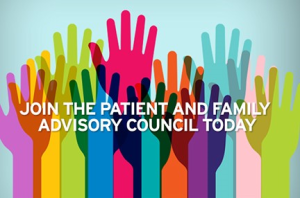 If so, please consider serving on our Patient and Family Advisory (PFA) Council. PFA Council members are patients, family members, and staff volunteers who advise on War Memorial Hospital policies, procedures, and practices. They are partners in care whose feedback and input are crucial to improving the overall patient and family experience for all. We value and strive for diversity in our member’s perspectives, opinions and healthcare experiences. Support War Memorial Hospital’s mission to improve the quality of life and health through partnerships with those we serve. Sault Ste. Marie, MI – Prescription drug and opioid abuse is an epidemic that impacts big and small towns, across the country, and the Easter Upper Peninsula is no exception. 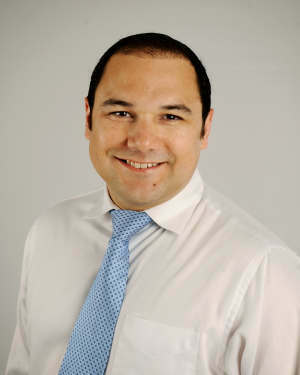 War Memorial Hospital Pain Management physician Andrew Alshab, MD MPH, a pain intervention specialist has received a $75,000 grant from the Michigan Center for Rural Health and Michigan Department of Health and Human Services to address opioid use disorder in the region. With the grant, a multi-disciplinary team will be addressing the needs of community members with chronic pain. “Patients and prescribers are often unsure how to meet pain needs of patients, as opioids are no longer recommended for chronic non-cancer pain. Individuals in our community are opioid reliant and need options for when opioids are no longer part of their treatment plan. The patients attending this clinic will have their pain needs addressed with comprehensive services in an evidenced based practice,” explained Alshab. The grant was designed in part, to help rural communities address the challenge of access to care. Services will be provided in three locations, including WMH Family Care in Cedarville, WMH Rehabilitation Center in Sault Ste. Marie, and WMH Pain Management in Kinross. Resources for patients will include interventional pain management services, pain medicine services, psychological services and physical and occupational therapy services during one visit. “Our community members in pain deserve access to the latest evidence based treatments to address their medical issues. This clinic will provide these resources at convenient locations for our patients. By providing direct face-to-face contact with patients we can improve both patient satisfaction and health outcomes,” explained David Jahn, WMH CEO. “When barriers to access the best pain medical treatments are present, patients and providers have resorted to the over utilization of prescription opioids. Current research and evidence has determined this solution does not work and places patients at additional health risk. The WMH clinic has been modeled on the Mayo Clinic Executive Health Program and will provide services to address pain by utilizing the current standards,” stated Alshab. Research shows that there is no “one size fits all” approach to addressing pain issues. The first step for patients in this program is meeting with the medical team, to assess critical factors in a collaborative setting. The team will work with the patient to set goals for medical care and create a comprehensive, personalized plan to address pain while decreasing opioid use. Each patient will then receive four weeks of professional services, to achieve the goals of the plan, including; pain management physician, psychiatric services, physical therapy/occupational therapy, and group sessions led by a psychologist. WMH will also be engaging community partners and providers by offering educational Lunch and Learns for area providers. Sessions will be held at the primary care clinics. Topics of discussion will include compliance issues with opioid use and prescribing opioid issues with recent changes in the Michigan Law. In addition, WMH is utilizing funding from the grant to reduce the number of opioids in our community and to help prevent relapse by adding three secured collection sites in remote areas of Chippewa County. For more information on WMH Pain Management or other War Memorial Hospital services and physicians, visit the War Memorial Hospital website at www.warmemorialhospital.org, or follow WMH on Facebook, Twitter and Linked In. Sault Ste. Marie, MI – War Memorial Hospital has received an ‘A’ for their success rate in patient safety from the national hospital watchdog group, Leapfrog Hospital Safety Grades. Leapfrog Hospital Safety Grades are assigned to more than 2,600 hospitals across the nation twice annually, in the spring and fall. The Leapfrog Hospital Safety Grade has become the gold standard measure of patient safety, cited recently in MSNBC, The New York Times, and AARP The Magazine. War Memorial Hospital received an ‘A’ from Leapfrog in the Fall of 2017 as well, making this consecutive ‘A’ ratings for patient safety. 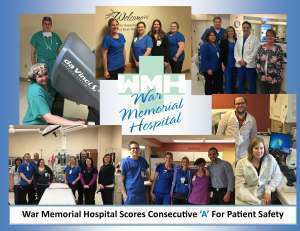 “Focusing on providing high quality, safe patient care has been a priority for all of the WMH Team for the last few years and to have received another ‘A’ grade from the Leapfrog group is quite an accomplishment for our Team,” said David Jahn CEO and President of War Memorial Hospital. “It is the front line care givers, physicians, nurses and ancillary staff who deserve all of the credit for this outstanding accomplishment. 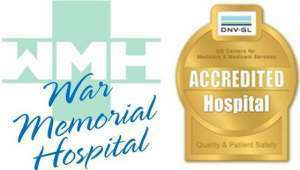 It is gratifying to know that when patients choose to come to WMH that they are coming to one of the safest hospitals in the State of Michigan and the Nation.” Along with War Memorial Hospital receiving an ‘A’, some of the other scores from the U.P. and Northern Lower Michigan were; Munson Medical Center in Traverse City receiving an ‘A’, McLaren Northern Michigan in Petoskey receiving a ‘B’, and UP Health System in Marquette received an ‘A’. Of this group, War Memorial Hospital is the only one to receive back to back A’s. Helen Newberry Joy Hospital in Newberry and Mackinac Straights Health System in St. Ignace were exempt from publically reporting due to being Critical Access Hospitals. As stated in the Leapfrog Hospital Safety Grades own website, “One of the most significant problems with today’s health care system is the failure to make safety and quality information available to the public. But the public deserves this information so they can make informed choices about where to receive care. The purpose of the Leapfrog Hospital Safety Grades is to bring this information to light in a way that is easy for the consumer to use. A hospital may have the best surgeons and greatest technology in the world, but unless it is preventing infections and eliminating errors, it is not delivering on a very basic premise: ensuring the safety of you and your loved ones. If you are choosing a hospital for you and your family make sure you know the facts about patient safety, and use the Leapfrog Hospital Safety Grades to find the safest possible care in your area”. The Leapfrog Hospital Safety Grades uses national performance measures from the Leapfrog Hospital Survey, the Agency for Healthcare Research and Quality (AHRQ), the Centers for Disease Control and Prevention (CDC), the Centers for Medicare and Medicaid Services (CMS), and the American Hospital Association’s Annual Survey and Health Information Technology Supplement. Leapfrog works under the guidance of the seven-member Blue Ribbon Expert Panel to select appropriate measures and develop a scoring methodology. The Expert Panel is made up of patient safety experts from across the country. For more information on The Hospital Safety Score, go to www.hospitalsafetygrade.org . For more information on War Memorial Hospital services and physicians, visit the War Memorial Hospital website at www.warmemorialhospital.org . You can also follow them on Facebook and Twitter. Sault Ste. 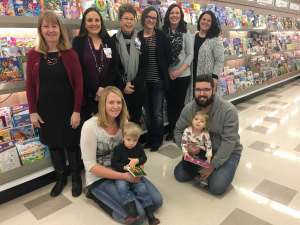 Marie, MI – A creative approach to engaging children to read is sprouting from a new collaboration between War Memorial Hospital, Meijer, the Eastern Upper Peninsula Great Start Collaborative and United Way of the EUP. A “Prescription” Reading program will be part of 5-year-old well child visits to encourage early literacy and brain development. War Memorial Hospital Pediatricians, Dr. Patricia Newhouse and Dr. Robert Beckman, as well as Riverside Medical, and Bridgeview Medical, will participate by sharing a reading prescription and free book to be given during the exam 5-year-olds are required to take before entering kindergarten. A “prescription for reading” from the doctor tells the patient that healthy brain development is as important as healthy bodies. The books were donated through Meijer with support from War Memorial Hospital. This idea is simple and targets the children and their families that might not realize the significance of habitual reading and reaching milestones in education such as 3rd grade literacy. Studies show children who are read to at least three times a week have significantly greater early literacy skills when they enter kindergarten than children who are read to less often. When young children are raised in a literacy-rich environment full of opportunities to listen to language and handle books, they begin to acquire the essential building blocks of reading. A child who enters school without these skills runs the risk of starting behind, and unfortunately staying behind. “A Prescription for Reading is an excellent opportunity for local physicians to discuss the importance of early literacy with parents at well-child visits,” said Jessica Savoie of the Great Start Collaborative. The innovative Prescription for Reading partnership provides young children with free quality books to enjoy at home along with simple literacy tips for caregivers to inspire children’s interest in reading early in life. The goal of this program is to encourage parents to read to their children on a regular basis, thereby increasing their vocabulary and communication abilities and creating a pathway to success. “This was a make-sense partnership between organizations already collaborating here in the EUP,” said Suzanne Prell, Executive Director of United Way of the EUP. The retail store Meijer moved into the Sault Ste Marie area one year ago. War Memorial Hospital opened a FastCare Clinic inside the store. “The Meijer corporation has been very supportive of non-profits and community organizations. They believe in giving back to the community to make it a better place to live,” said Prell. For more information, visit www.unitedwayeup.org or call the United Way at 906-632-3700, or email barb@unitedwayeup.org . For more information on War Memorial Hospital services and physicians, visit the War Memorial Hospital website at www.warmemorialhospital.org . You can also follow WMH on Facebook, Twitter and LinkedIn. For more information on the EUP Great Start Collaborative, visit www.eupkids.com or follow EUP Great Start Parents & Collaborative on Facebook. Sault Ste. Marie, MI – Community members may have received a letter from FastHealth Interactive Healthcare notifying them of a security incident. War Memorial Hospital has received inquiries from staff and community members regarding the legitimacy of the letter. FastHealth provides website programming and hosting for hundreds of hospitals and other healthcare organizations. FastHealth provided these services for WMH from January 2009 through August of 2013. “This potential breach of information of the FastHealth servers is unfortunate. WMH discontinued contracted services in 2013. We take the privacy of community members, employees and patients very seriously,” said David Jahn, CEO of WMH. “WMH conducts annual security audits through an independent firm to ensure the security of Personal Health Information (PHI).” He added. FastHealth determined, through a lengthy investigation, that an unauthorized third-party accessed their web server, and may have been able to acquire information from certain databases. It is unknown as to whether the databases were breached or if information was actually retrieved. The FastHealth server in question contained information submitted on the WMH employment application forms, from which, information may or may not have been accessed. The information did not include Health Information protected (PHI) by HIPAA such as medical records, patient portal data, online bill pay information such as credit card or bank account, or any other forms on the web site or linked to/from the web site. FastHealth is required to notify persons who may have been affected by this unauthorized access to the FastHealth server and has sent letters to those whose information had the potential to be accessed. FastHealth is offering one year’s identity monitoring services to all persons who receive the letter. Service includes credit monitoring, fraud consultation, and identity theft restoration. If you have received a letter, and have questions, comments or concerns, WMH recommends contacting FastHealth directly at the number included in the letter (1-833-215-3730). War Memorial Hospital Scores Top 20 Rural Hospitals in The U.S.
Sault Ste. Marie, MI – Last week War Memorial Hospital received recognition for scoring in the Top 100 Rural Community Hospitals in the United States at the National Rural Health Association’s (NRHA) Rural Health Policy Institute. 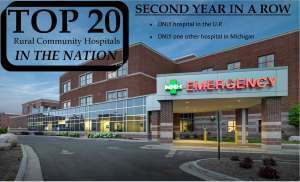 Within days of that notification, WMH CEO and President David Jahn received word that War Memorial Hospital will be receiving special recognition for scoring in the Top 20 Rural Community Hospitals in the U.S., for the second year in a row. War Memorial Hospital, along with the 19 other hospitals from across the United States, will be recognized and awarded at a ceremony to be held during NRHA’s Rural Hospital Innovation Summit conference May 11 in New Orleans, La. Sault Ste. Marie, MI – War Memorial Hospital Pain Management has been leading the way, utilizing an evidence based, multidisciplinary approach to manage pain for patients in the Eastern Upper Peninsula and Northern Lower Michigan. WMH announced last week that they are now offering two locations to better serve the community. WMH Pain Management physicians focus on a multidisciplinary approach to pain management, using interventional pain procedures to identify and treat pain generators, along with physical/occupational therapy to strengthen and re-coordinate muscles and identify areas of the patient’s pain that impact daily tasks. Through the process of rehabilitation the patient’s medication is continuously monitored and adjusted based on their response to treatment, with the overall goal being a life without opioid dependency. Dr. Andrew Alshab, MD, MPH will see patients at the Kincheloe location, 16523 Water Tower Drive. He will now be offering extended twelve hour days on Monday, Tuesday and Thursdays to facilitate same day services for patients. “I have been providing pain management services full time for the past 11 years and address patients’ pain issues in a compassionate evidenced based approach,” said Dr. Andrew Alshab. “For patients still on chronic opioids, we also offer an active weaning program within a comprehensive approach, so that pain can be addressed in a caring, efficient manner.” The office of Dr. Alshab can be contacted at 906 – 632-5849. Dr. Ali Daha, MD will be seeing patients at a new location in Sault Ste. Marie at 146 Spruce Street, across the street from the WMH Emergency Department. “We are excited to be able to offer evidence based, multidisciplinary pain management services with emphasis on interventional modalities at our new clinic on Spruce Street,” said Dr. Ali Daha. “We look forward to continuing to serve the needs of our community and our patients with the highest standards of care. We thank the community and our patients for their ongoing support. My dedicated staff gives 100% to treat your pain and help improve your quality of life.” The office of Dr. Daha can be reached at 906 – 253-0113. 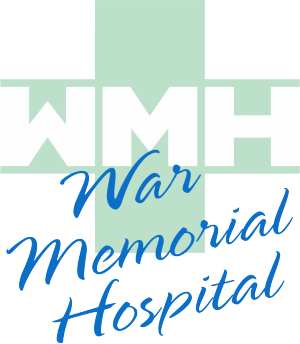 For more information on WMH Pain Management or other War Memorial Hospital services and physicians, visit the War Memorial Hospital website at www.warmemorialhospital.org . You can also follow them on Facebook, Twitter and Linked In. Sault Ste. Marie, MI – This New Year’s Eve, as most will be counting down to the New Year, War Memorial Hospital staff will be on-site to the launch of the new, One Patient, One Record, electronic health record (EHR) upgrade which will be available to all patients January 1st, 2018. The new system will allow all physicians to access patient information in one location. The EHR also comes with enhancements to the interactive web portal which will empower patients and their families to take a more active role in their care by providing easy, secure access to their health information and online communication with War Memorial Hospital staff. WMH Patient Portal gives patients instant access to their health information, including laboratory and radiology results, medications, allergies, demographic information, visit history, discharge/aftercare information, and more. Patients can also access their billing statements and outstanding balances and submit electronic payments. In addition to handling their own care, health care proxies with authorized consent will have the ability to access the records of those individuals for whom they manage care. In addition, the WMH Patient Portal allows patients to request and track their appointments online. Patients can request appointments for specific timeframes, add comments and contact preferences, and receive an email confirmation once an appointment is scheduled. A central appointment page displays their list of scheduled and pending appointments. They can review appointment details and if necessary, reschedule or cancel appointments. WMH Patient Portal also saves patients time by allowing them to make updates to their demographic and contact information prior to their visits. Patients can use WMH Patient Portal to communicate with their physicians, as well. They can submit questions through a secure messaging center and receive their physicians’ responses. They can also request prescription renewals online instead of calling the office. Email notifications alert them to any new activity on their portal such as test results, messages, or appointments. Anyone interested in enrolling in WMH Patient Portal should contact War Memorial Hospital’s Medical Record department at 906-635-4370 or visit the website at www.warmemorialhospital.org. War Memorial Hospital encourages all of their patients to enroll in in the new WMH Patient Portal, as it presents a valuable opportunity for patients and their families to actively participate in their care. For more information on War Memorial Hospital services and physicians, visit the War Memorial Hospital website at www.warmemorialhospital.org . You can also follow them on Facebook, Twitter and Linked In. Sault Ste. 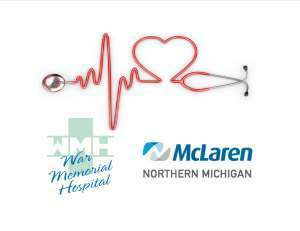 Marie, MI – Since 2014 War Memorial Hospital and McLaren Northern Michigan Hospital from Petoskey have partnered to bring enhanced cardiology care to the patients of WMH and the Eastern Upper Peninsula. McLaren Northern Michigan was recently named one of the nation’s 50 Top Cardiovascular Hospitals of 2018 by IBM Watson Health. The annual study, conducted by Truven Health Analytics (now part of IBM Watson Health), identifies the top hospitals in the United States for inpatient cardiovascular services. This program is widely regarded as the leading program for evaluating leadership impact in a hospital, as well as for evaluating quality indicators and efficiencies. The study uses hospital performance metrics to identify the highest performing cardiovascular service lines in the nation. The 50 hospitals on Watson Health's list, including McLaren Northern Michigan, excelled in clinical outcomes for heart attack and heart failure treatments, as well as coronary bypass and angioplasty surgeries, compared to the 1,016 hospitals studied nationwide. The top 50 hospitals performed better on mortality and complications, 30-day mortality, and readmissions. On average, their procedures cost less and patients had shorter hospital stays. To determine the 50 top U.S. hospitals for heart care, IBM Watson Health researchers analyzed 2015 and 2016 Medicare Provider Analysis and Review (MEDPAR) data, 2016 Medicare cost reports, and Centers for Medicare & Medicaid Services (CMS) Hospital Compare July 1, 2013-June 30, 2016 data. For more information on War Memorial Hospital Cardiology services and physicians, visit the War Memorial Hospital website at www.warmemorialhospital.org . You can also follow them on Facebook and Twitter. Sault Ste. Marie, MI – War Memorial Hospital has received an ‘A’ for their success rate in patient safety from the national hospital watchdog group, Leapfrog Hospital Safety Grades. The Leapfrog Hospital Safety Grades uses national performance measures from the Leapfrog Hospital Survey, the Agency for Healthcare Research and Quality (AHRQ), the Centers for Disease Control and Prevention (CDC), the Centers for Medicare and Medicaid Services (CMS), and the American Hospital Association’s Annual Survey and Health Information Technology Supplement. Leapfrog works under the guidance of the seven-member Blue Ribbon Expert Panel to select appropriate measures and develop a scoring methodology. The Expert Panel is made up of patient safety experts from across the country. “It is always gratifying to see that all of the WMH Team’s hard work on making sure that we deliver high quality, safe patient care is being recognized”, explains War Memorial Hospital CEO David Jahn. “All of the credit goes to our team of dedicated healthcare professionals and support staff who have made this possible. We are honored to have received an “A” grade from the Leapfrog Group and we will continue to keep the patient and the care that we provide to each patient as our number one priority. Along with War Memorial Hospital receiving an ‘A’, some of the other scores from the U.P. and Northern Lower Michigan were; Munson Medical Center in Traverse City receiving a ‘B’, McLaren Northern Michigan in Petoskey receiving a ‘B’, and UP Health System in Marquette received a ‘C’. Helen Newberry Joy Hospital in Newberry and Mackinac Straights Health System in St. Ignace were exempt from publically reporting due to being Critical Access Hospitals. 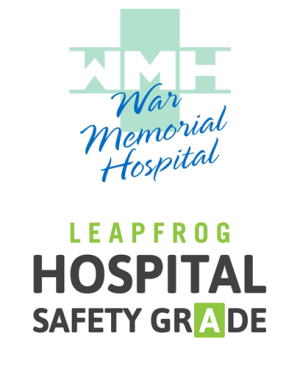 Leapfrog Hospital Safety Grades are assigned to more than 2,600 hospitals across the nation twice annually, in the spring and fall. The Leapfrog Hospital Safety Grade is becoming the gold standard measure of patient safety, cited recently in MSNBC, The New York Times, and AARP The Magazine. For more information on The Hospital Safety Score, go to www.hospitalsafetygrade.org . Sault Ste. Marie, MI – War Memorial Hospital proudly announces its Pharmacy’s achievement of PCAB accreditation, a service of the Accreditation Commission for Health Care (ACHC). The accreditation is awarded in recognition of the pharmacy’s commitment to meeting and/or exceeding national quality standards. Compounding medications is an integral part of the practice of pharmacy and the demand of these customized medications increases every year. Compound medications are prescriptions that are written by physicians and prepared for an individual patient by a specially trained pharmacist. 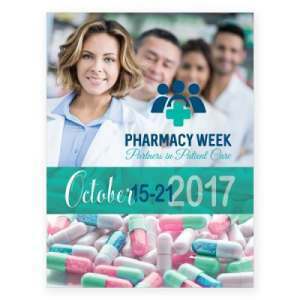 Along with receiving the accreditation, War Memorial Hospital is also recognizing the hard work of their pharmacist during National Pharmacy Week, October 15th through the 21st, titled, “Partners in Patient Care”. Sault Ste. Marie, MI – War Memorial Hospital announces the successful completion of renewing itsaccreditation from DNV GL - Healthcare. DNV GL’s accreditation program, called NIAHO® (Integrated Accreditation of Healthcare Organizations), involves annual hospital surveys – instead of every three years – and encourages hospitals to openly share information across departments and to discover improvements in clinical workflows and safety protocols. By maintaining accreditation, War Memorial Hospital has demonstrated it meets or exceeds patient safety standards (Conditions of Participation) set forth by the U.S. Centers for Medicare and Medicaid Services. DNV GL’s accreditation program is the only accrediting body to integrate the ISO 9001 Quality Management System with the Medicare Conditions of Participation. War Memorial Hospital initially received its accreditation in 2011 that proved compliance with ISO 9001, the world’s most trusted quality management system used by performance-driven organizations around the world to advance their quality and sustainability objectives. “We have taken an entirely different approach to accreditation and hospitals are really responding,” says DNV GL - Healthcare CEO Patrick Horine. “Since accreditation is a must-have credential for just about every hospital in this country, why not make it more valuable, and get more out of it? That’s where ISO 9001 comes into play, and turns the typical get-your-ticket-punched accreditation exercise into a quality transformation.” For more information about DNV GL hospital accreditation, visit www.dnvglhealthcare.com. For more information on War Memorial Hospital services and physicians, visit the War Memorial Hospital website at www.warmemorialhospital.org . You can also follow WMH on Facebook and Twitter. Sault Ste. Marie, MI – War Memorial Hospital is a proud sponsor of a 10 week initiative that is coming to Sault Ste. Marie to help promote health and fitness across the community. “Get Fit Sault Ste. Marie” officially kicks of Saturday, October 7th and the entire community is eligible, and encouraged to participate. The official start date, and weigh in, is Saturday, October 7th from 8am – 2pm at Gym 906 on Ashmun Street. A $20 entry fee will be due at that time, with a winner in the men and women’s category for most percentage of weight lost at the end of the 10 weeks. Complete and official rules can be found at www.sooeveningnews.com. Sault Ste. 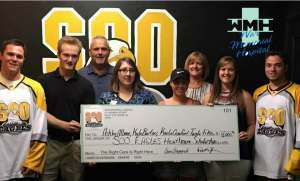 Marie, MI – War Memorial Hospital and the Soo Eagles Hockey program, long time community partners, announced earlier this summer they were giving up to $4,000 in Healthcare Scholarships, benefiting both graduating high school seniors and current War Memorial Hospital Employees. The scholarship awards were based on a variety of criteria like short essays on why they desire to enter the healthcare profession or why they desire to further their education in the field, along with letters of recommendations, proof of graduation and acceptance into a healthcare program for the fall semester. All applicants were reviewed by a selection committee and four one-time $1,000.00 scholarships were awarded to; Sault Area High School graduate Kyle Bruton. DeTour High School graduate Kaalin Crawford, along with current WMH employees Twyla Fike and Ashley Albone. Sault Ste. Marie, MI – Being by the side of a loved one during the final days and hours is a time when families should have privacy and comfort. War Memorial Hospital, along with the family of Lillian Rawlings, and Betty LaJoie, are making sure that is now possible in the WMH Long Term Care (LTC) wing. Last year, when the family of Lillian Rawlings was at her bedside in the WMH LTC unit privacy was a challenge. “The Long Term Care staff is fabulous,” explains daughter Julia Rawlings. “They do everything they can to make you comfortable and they realize it’s a difficult time. My mom shared a room with three other people. There were eight of us crowded around my mom’s bed. This isn’t the way a family should have to go through this. The staff was just super to us, but a family needs more space.” It was their goal to work with WMH, to create a room where families can now have end of life privacy and comfort. It was their vision and generosity that got the project rolling. 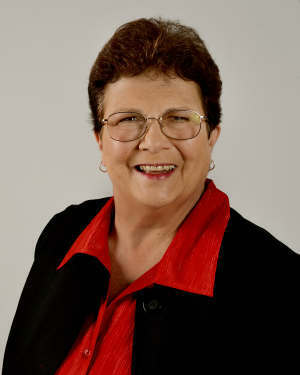 Shortly after, former longtime WMH employee, Betty Lajoie passed away. In memory of their mother, and her years of service with War Memorial Hospital, Betty’s family wanted support a project in her name. The new room now offers a comfortable, homey space for families during a difficult time, equipped with a pullout couch for loved ones who wish to stay the night, fully accessible restroom and shower, shelves to display family photos and mementos. There is even a Keurig coffee machine, changing station and artwork on the wall that was chosen by the residents of LTC. “It is very gratifying to see the new Family Respite Room finished and available for the use of LTC residents and their families,” said Lillian Rawlings other daughter, Ruth Neveu. “I know my late mother would be very pleased to see such a beautiful room now available for families.” War Memorial Hospital offers a 51 bed Long Term Care Unit that is available for patients coming in for short-term rehabilitation following surgery or illness, or will make LTC their home. Recreational activities are available daily for residents. Beauty/Barber shop services are onsite as are physician and vision services. Sault Ste. Marie, MI – The Caregiver is often referred to as “The Silent Hero.” At the end of the day, caregivers are often left wondering if what they are doing is enough for their loved one. For those who are going through this, it’s important they understand they are not alone. War Memorial Hospital is offering a new Caregiver Support Group for those caring for cancer patients, the first group of its kind in the U.P. The caregiver support group will be offered every first and third Wednesday of the month, from 6pm – 7pm with the first one scheduled for Wednesday, June 7th. The group will meet at the WMH Cancer Care Center waiting room, located at 509 Osborn Blvd., Suite 220. Educational materials and nutritional snacks will be provided. No RSVP’s are needed. If you have any questions regarding this new initiative, please call 253-2685. Sault Ste. Marie, MI – After 28 years of service, Vice President of Rehabilitation, Jim Haglund is ready to enjoy retirement. During his tenure, Jim’s responsibilities ranged from overseeing the general operations of the department including recruitment, immigration requirements, financial and statistical planning/assessment, contract negotiations, and regulatory compliance. Jim holds degrees from the University of Minnesota (Bachelor of Science, with Distinction), St. Louis University Medical School (Masters of Science Research in Anatomy), Lake Superior State University (Masters in Business Administration and Masters in Public Administration-Health Care Option), and Arizona School of Health Sciences (Doctorate). In 2012, Jim was notified of his induction into the Saint Louis University Alumni Entrepreneurial Hall of Fame in Saint Louis, Missouri for his role in the development of War Memorial Hospital's rehabilitation department. He was one of only five individuals selected by a blue-ribbon panel composed of prestigious national entrepreneurs and community leaders from thousands of alumni. 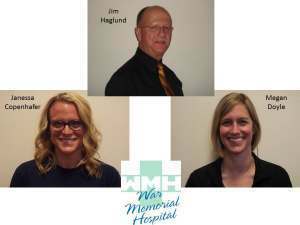 Jim Hagland’s position will be filled by Janessa Copenhafer and Megan Doyle, long time employees for the WMH Rehab Center. Janessa Copenhafer is a licensed physical therapist and has been with War Memorial Hospital since 2010. She holds degrees from Grand Valley State University (Bachelor of Science in Health Science and Doctorate of Physical Therapy) and in 2015 she furthered her education by becoming a Wound Care Certified clinician through the National Alliance of Wound Care and Ostomy. In 2012 and 2015, Janessa was acknowledged as the best physical therapist of Chippewa/Luce/Mackinac Counties by the readers of The Evening News. “Coming from downstate and being away from all that I have ever known, for me, War Memorial Hospital is not just a place of employment and Sault Sainte Marie is not just a place to live but now both are truly my home and I care about this community and its’ people,” said Copenhafer. “I am proud to be a part of this organization and I am excited for the future of the department and working alongside Megan. I know that with the support from my peers and their continued hard work and diverse skillset, rehab will continue to be a success. " Megan Doyle has worked for the WMH Rehab Center for ten years, receiving her Physical Therapist license in 2007. Megan also holds a Bachelor of Science in Biology from Trinity University, a Master of Physical Therapy and post-professional Doctorate of Physical Therapy from the University of Texas Health Science Center in San Antonio, and is a Certified Lymphedema Therapist. She also specialize in women's and men’s health. “I feel very honored and thrilled to be Co-director of WMH Rehabilitation with Janessa. Jim was a wonderful mentor and has prepared us very well. I am proud to be part of such an amazing team, and our goal will always be to provide top quality patient care,” says Doyle. Sault Ste. 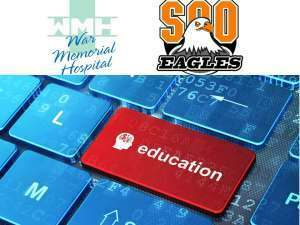 Marie, MI – War Memorial Hospital and the Soo Eagles Hockey program haven been long time community partners, and are partnering together again to give up to $4,000.00 in Healthcare Scholarships, benefiting both graduating high school seniors and current War Memorial Hospital Employees. Up to 4 one-time $1,000.00 scholarships will be awarded to qualifying applicants wishing to further their education in the healthcare profession. To be eligible, 2017 graduating seniors must be a graduate of a Chippewa County High School and submit the following; a high school transcript, a short essay on, “Why I desire to enter in the healthcare profession” (no more than 500 words), a copy of an acceptance letter into a healthcare program for the fall of 2017, and two letters of recommendation attesting to character and leadership ability. Current WMH employees must submit a short essay on, “Why I desire to further my education in the healthcare profession” (no more than 500 words), a copy of an acceptance letter into a healthcare program for the fall of 2017, and two letters of recommendation attesting to your character and leadership ability. Sault Ste. Marie, MI – A War Memorial Hospital FastCare retail health clinic is opening its’ doors inside of the new Meijer, located at 1138 West 3 Mile Road in the Sault. The new clinic will be offering basic health care needs, and is scheduled to open on May 18th, 2017. FastCare clinics offer convenient and economical health care for minor conditions and symptoms. Conditions treated include sore throats, fevers, flu and colds, ear and sinus infections, pink eye, skin rashes and allergies. FastCare takes walk-in patients only, but waits are expected to be non-existent or minimal. In addition, faster pharmacy service will be provided based on immediate transmittal of prescriptions to the Meijer pharmacy or the pharmacy of the patient’s choice. FastCare accepts most insurances and office visit co-pays apply. For those with a high deductible plan or no insurance, a FastCare visit is $69, including basic labs. The clinic is staffed by War Memorial Hospital practitioners and physician assistants, however, you don’t have to be a WMH patient to be seen. The clinic is open to anyone. A report following each visit can be sent to a Patient’s primary care physician and referrals will be made to a physician when symptoms exceed the clinic’s scope of services. The clinic will provide convenient hours: Monday through Friday 9am – 7pm, Saturdays 10am – 6pm, Sundays 10am – 2pm, and Christmas Eve and New Year Eve 10am – 2pm. Closed on major Holidays. Meijer is a Grand Rapids, Mich.-based retailer that operates more than 230 supercenters and grocery stores throughout Michigan, Ohio, Indiana, Illinois, Kentucky and Wisconsin. A privately-owned and family-operated company since 1934, Meijer pioneered the “one-stop shopping” concept and has evolved through the years to include expanded fresh produce and meat departments, as well as pharmacies, comprehensive apparel departments, pet departments, garden centers, toys and electronics. For additional information on Meijer, please visit www.meijer.com. Follow Meijer on Twitter @twitter.com/Meijer and @twitter.com/MeijerPR or become a fan at www.facebook.com/meijer. The FastCare model of retail health clinics was established by Bellin Health in 2006. FastCare partners with health systems and retailers across the country to create affordable and convenient patient access to healthcare. More information about FastCare is available at http://www.FastCare.com. Sault Ste. Marie, MI – Last month it was reported that War Memorial Hospital received recognition for scoring in the Top 100 Rural Community Hospitals in the United States at the National Rural Health Association’s (NRHA) Rural Health Policy Institute. Last week, War Memorial Hospital CEO David Jahn received word that War Memorial Hospital will be receiving special recognition for scoring in the Top 20 Rural Community Hospitals in the U.S.
War Memorial Hospital, along with the 19 other hospitals from across the United States, will be recognized and awarded at a ceremony to be held during NRHA’s Rural Hospital Innovation Summit conference May 11 in San Diego, Calif.
Sault Ste. Marie, MI – May 25th, 1961, President John F. Kennedy gave a historic speech before a joint session of Congress that became known as the Moonshot Project. He challenged the United States to establish an ambitious space program, one that would put a man on the moon. Eight years later, Apollo 11 brought the first human to the moon. Fifty-five years later, former President Obama challenged former Vice President, Joe Biden, to head up a new moonshot, The Cancer Moonshot. The ultimate goal of this new venture is to make a decade’s worth of advances in cancer prevention and treatment in five years. This national effort to end cancer care as we know it transcends political lines and will continue to move forward being led by the Cancer Moonshot Task Force. The CMTF has reached out to leading specialists and researchers from all corners of the United States, all facing different challenges in the fight against cancer. War Memorial Hospital oncologist Dr. Belisario Arango, was one of those honored with an invite to The White House to meet with the CMTF. Sault Ste. Marie, MI – The challenges of healthcare in rural America was something Dr. Belisario Arango, WMH Oncologist, was very much aware of when he made the decision to move to Sault Ste. Marie. Today he is even more determined to use technology to bring state of the art cancer care to War Memorial Hospital with a company called Massive Bio, which will utilize some of the top Oncologist in the United States, for patients’ right here in Northern Michigan. Access to this new tool could provide hope to those who may have run out of options. However, Arango is quick to explain, even with the services of Massive Bio, there is no silver bullet where cancer is concerned. It is only for patients with advanced cancers who have exhausted standard treatment protocols. But by using Massive Bio, Arango can locate any clinical trials appropriate for the patient and assistance facilitating that process. War Memorial Hospital Scores Top 100 Rural Hospitals in The U.S.
Sault Ste. 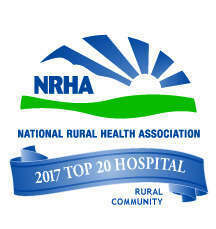 Marie, MI – The Top 100 Rural and Community Hospitals in the U.S. were revealed last week at the National Rural Health Association’s (NRHA) Rural Health Policy Institute, as determined by NRHA, iVantage Health Analytics and the Chartis Center for Rural Health, and War Memorial Hospital has scored in the top 100. The hospitals named to this list are top performers in managing risk, achieving higher quality, securing better outcomes, increasing patient satisfaction and operating at a lower cost than their peers. Sault Ste. 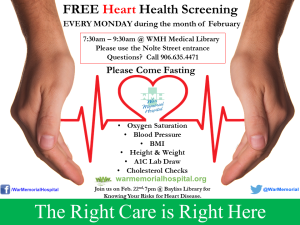 Marie, MI – February is American Heart Month and in honor of the month, War Memorial Hospital is offering free Heart Health Screens to the community. Every Monday morning during the month of February, between 7:30am and 9:30am, the health screens will be available in War Memorial Hospital’s Medical Library, located on the main floor of the hospital. Please come fasting and use the Nolte Street entrance to access the library. With this free screen the patient will receive information on oxygen saturation, blood pressure, height and weight, Body Mass Index (BMI), a check on cholesterol, and A1C Lab Draw to check blood sugar levels. If you have any questions you can call 635-4471. There will also be two speaking events available for the public to attend. The first is Wednesday, February 8th at Lake Superior State University, Crawford Hall, room 204. Joan Ilardo, PhD, LMSW will be speaking on, “Making a Difference: The Pursuit of Health and Well-Being in Your Community.” The event starts at 7pm and is sponsored by War Memorial Hospital, Lake Superior State University and the Michigan State University College of Human Medicine. The second talk is Wednesday February 22nd at Bayliss Public Library starting at 7pm. 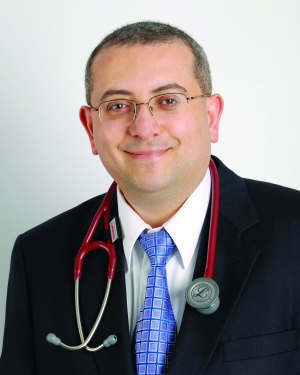 Dr. Waleed Doghmi will be speaking on, “Knowing Your Risks For Heart Disease.” The event is sponsored by War Memorial Hospital, in partnership with McLaren Northern Michigan. Both speaking events are free to the public. Sault Ste. Marie, MI – National CRNA Week (Jan. 22-28, 2017) celebrates “Safe and Effective Anesthesia Care for Every Patient,” as well as the anesthesia experts known as Certified Registered Nurse Anesthetists or CRNAs. This year’s theme highlights one of the hallmarks of the nurse anesthesia profession: providing safe, effective anesthetics annually to millions of patients for every type of procedure and in every type of setting where anesthesia is required. 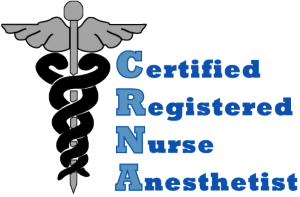 National CRNA Week was established by the American Association of Nurse Anesthetists (AANA) 18 years ago to educate patients and the public about anesthesia safety and the benefits of receiving anesthesia care from CRNAs. Nurse anesthetists safely deliver approximately 43 million anesthetics to patients each year in the United States, staying with their patients throughout their entire procedure. their patients, co-workers and within their local communities. CRNAs practice in traditional hospital surgical suites and obstetrical delivery rooms; critical access hospitals; ambulatory surgical centers; the offices of dentists, podiatrists, ophthalmologists, plastic surgeons, and pain management specialists; and U.S. military, Public Health Services, and Department of Veterans Affairs healthcare facilities. For more information on National CRNA Week, go to www.aana.com . Sault Ste. 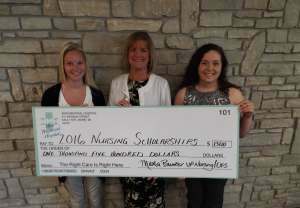 Marie, MI – This year War Memorial Hospital awarded three Sault Area High School Students the 2016 War Memorial Nursing Scholarship, for their University/College studies in Nursing for the this academic year. Alison Molitor and Kierstie Piche-Belleau, both attending Lake Superior State University, and Taylor Kalchik, attending Northern Michigan University, were the recipients. The three students were Allied Health Seniors from Sault Area High School, each receiving a five-hundred dollar scholarship. “We look for student leaders who are passionate about nursing and who want to learn and apply what they learn,” explained Marla Bunker, WMH Vice President of Nursing/Operations. The scholarships were available to any SAHS Senior, with guidelines that had to be met, such as: a High School Transcript with a GPA of at least a 3.00, a short essay on “Why I Desire to Enter the Nursing Profession” along with educational goals, verification of acceptance into a nursing program for the fall of 2016, and letters of recommendation attesting to their character and leadership abilities. Sault Ste. 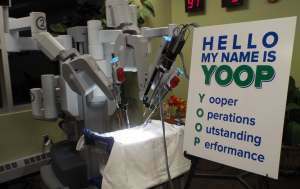 Marie, MI – Recently, War Memorial Hospital announced the arrival of their da Vinci surgical robot, becoming the only hospital north of Traverse City, and throughout the entire Upper Peninsula, to offer this new robotic surgery. “There were so many creative and fun entries, this was not an easy choice,” said Director of Surgical Services Reagen Jacek. “It came down to choosing one that we thought represented our area and what the robot will bring to our hospital.” Of the hundreds of entries, there were two other entries to receive honorable mention. Twelve year old Brynn Jannetta, submitted the name Wally. Brynn said, “I think you should name the robot Wally or Wall-E after the Disney robot Wall-E because he saved so many lives just like our new da Vinci robot will.” The second honorable mention goes to a group of Neebish Island residents who submitted the name Tucker, in honor of Don Tucker. Tucker received surgery earlier in the summer at War Memorial Hospital, from Dr. Paula Rechner, prior to the arrival of YOOP. Dr. Rechner used his case to convince the administrative team that WMH would benefit from a surgical robot, that Tucker’s surgery would have been less invasive with a quicker recovery time. A few months after that surgery, YOOP arrived at War Memorial. The name was officially revealed at the Chamber of Commerce Business after 5 event that was held at War Memorial Hospital. WMH CEO David Jahn, and WMH surgeons, Dr. Sara Amo and Dr. Paula Rechner, announced the winning name. Sault Ste. Marie, MI – War Memorial Hospital has received 4 out of 5 stars in the recent quality star rating from the Hospital Quality Initiative. The Centers for Medicare & Medicaid Services (CMS) use the Hospital Quality Initiative as a “way to help stimulate and support improvements in the quality of care delivered by hospitals. The intent is to help improve hospitals’ quality of care by distributing objective, easy to understand data on hospital performance, and quality information from consumer perspectives,” according to the Medicare.gov website. Hospitals’ are ranked on five criteria; mortality, safety care, readmission, patient experience, effectiveness of care, timeliness of care, and efficient use of medical imaging. They can receive a rating of above national average, same as national average, or below national average. War Memorial received ratings of “same as national average” in four categories, and one “above national average” in the category of “patient experience.” Their score of 4 out of 5 stars ranks them higher than Munson Medical Center in Traverse City, Marquette General Hospital in Marquette, Helen Newberry Joy Hospital in Newberry, and even University of Michigan Health Systems in Ann Arbor, all who received 3 out of 5 stars. The 4 Star Quality Rating, is in addition to War Memorial Hospital receiving an ‘A’ for patient safety from the national hospital watchdog group, Hospital Safety Score, and The Gold Standard for Workplace Fitness from the American Heart Association. War Memorial Hospital is pleased to announce the return of Dr. Patricia Newhouse, pediatrician, to the growing family of healthcare providers. Dr. Newhouse worked at WMH until 1994 when she left to continue her education in healthcare and pediatrics. She returns to Sault Ste. Marie to be near her family and to start her new practice of War Memorial Hospital Community Care Clinic – Pediatrics. Dr. Newhouse will provide healthcare to children from birth to 18 years of age, specializing in developmental disabilities, ADHD, and autism. “I am so excited to be back in Sault Ste. Marie, close to my family, and ready to provide care for the children in our area. I’m pleased to be back at a hospital that has always meant so much to me,” said Newhouse. New patients are now being accepted. Please call 906-635-4401 to schedule an appointment. 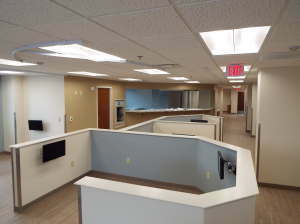 The practice is located at 509 Osborn Blvd, suite 160, conveniently connected to the skywalk and parking garage. For more information on War Memorial Hospital and the services they offer, please contact the Community Relations Department at 906-635-4351. Click on the link below to read about Dr. Rajeev Sehgal, a foot and ankle specialist who has delivered care to EUP patients for six years and says "I look forward to seeing many more patients in the future." Details on how to make your appointment in the PDF below. WMH is pleased to welcome Dr. Shane Woolever to his new home at War Memorial Hospital Orthopedics, where he will practice alongside Dr. Richard Ganzorn. Get more details on this new practice at the link below. Preventative care is one of the most important things we can do to manage our health, including being active, eating healthy and getting an annual physical. As we age, what more can be done to identify and prevent the most common ailments? Join Dr. David Walsworth at a Your Health lecture to learn about appropriate health screenings for adults at 7 p.m., Wednesday, Feb. 17, in Lake Superior State University’s Crawford Hall, room 204. Admission is free. For example, the following recommendations are based on the work of the U.S. Preventive Services Task Force and NIH Institutes. Blood pressure should be checked at least every two years. Women should have their cholesterol checked regularly starting at age 45; men every five years beginning at 35. If you smoke, have diabetes, or if heart disease runs in your family, start having your cholesterol checked at age 20. Walsworth will discuss these and other diagnostic tools such as mammograms, Pap smears, and colorectal cancer tests that can find diseases and conditions early when they are easier to treat. David Walsworth is an associate professor and associate chair for clinical affairs with the Department of Family Medicine in Michigan State University's College of Human Medicine. 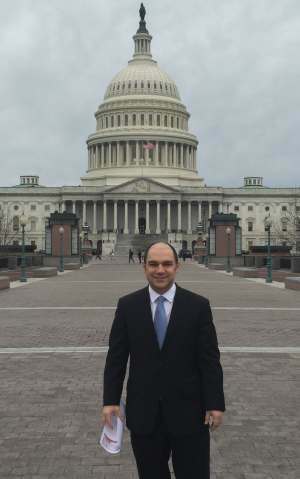 He is also an MD and fellow of the American Academy of Family Physicians. Prior to joining MSU, he was vice chief of Family Medicine at Oakwood Annapolis Hospital. He is board-certified in family medicine. Walsworth serves on the board of directors for the Michigan State Medical Society and the Michigan Academy of Family Physicians. The Your Health Lecture Series is a collaborative community event sponsored by Lake Superior State University, War Memorial Hospital and Michigan State University College of Human Medicine Upper Peninsula Region Campus. 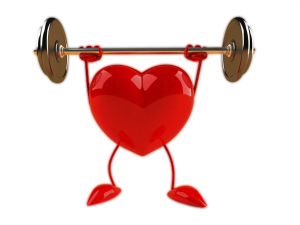 In recognition of February being American Heart Month, War Memorial Hospital and McLaren Northern Michigan invite the community to come to a free heart health presentation on Wednesday, February 3 from 7-8 p.m. at the Bayliss Public Library in Sault Ste. Marie, MI. Waleed H. Doghmi, MD, FACC, FACP, cardiologist with McLaren Northern Michigan, and War Memorial Hospital, will provide expert knowledge on what you can do to lower your risk of heart disease. In addition to his presentation, he will hold a question and answer session. For more information on War Memorial Hospital and the services they offer, please contact the Community Relations Department at 906-635-4351 or visit the WMH website at www.warmemorialhospital.org. Sault Ste. 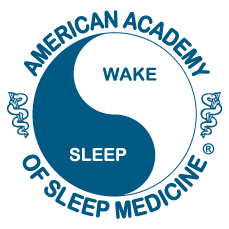 Marie, MI – War Memorial Hospital’s Sleep Center has received a five year accreditation by the American Academy of Sleep Medicine. The following is an excerpt from the letter received with the accreditation. The War Memorial Sleep Disorders Center is located on the second floor of the Community Medical Center Building. For more information on the services provided you can call 906-253-2788, or visit the WMH website at www.warmemorialhospital.org. Sault Ste. Marie, MI – War Memorial Hospital is hosting an open house for their state of the art Cancer Care Center, on Tuesday, December 15th. The event will run from 5pm – 7pm on the second floor of the Medical Office Building, 509 Osborn Boulevard. The official ribbon cutting ceremony will take place at 5:15pm and light refreshments will be provided. Beginning January 4th, oncologist Dr. Belisario Arango, MD will start seeing patients in the newly renovated space. Dr. Arango and his dedicated staff will now provide comprehensive care all under one roof, including chemotherapy, lab work, infusion therapies and other procedures. “The cancer center is a significant upgrade for our community,” said Arango. “Our capacity to take care of patients, administer targeted treatments such as immune therapy, monoclonal antibodies and chemotherapy, is much enhanced. This is bringing our facility up to date.” The center will feature more treatment stations and enhanced privacy in a welcoming and comfortable environment for patients and their families close to home. Patients and staff are looking forward to the move. “We are very excited about the opening of our new Cancer Center. Dr. Arango, the nurses and other staff in our Oncology Department have always provided exceptional care to the patients that they serve and now we will be able to offer a state of the art facility which will improve the patient care experience even more,” explained War Memorial Hospital CEO David Jahn. A unique fundraising opportunity for the Cancer Care Center is available. Donors may purchase a personalized tile in honor of someone, in memory of a loved one, or simply to show support for cancer patients and their families in the EUP. The tiles will be on permanent display in the Family and Patient Waiting Area of the new space. For more information on the Open House or to purchase a tile in support of high quality cancer care in the EUP, please contact the Community Relations Department at 906-635-4351. Dr. Bensson Samuel shares his expertise on the topic of Celiac Disease in this article printed in The Evening News. PLEASE NOTE: The phone number in the article is incorrect. To make an appointment, call 906-253-2652. You can also listen to an interview with Dr. Samuel where he talks about gluten and Celiac Disease by clicking this link. See the PDF below for the Balloon Sinuplasty news release. You can also watch this animation to better understand how balloon sinuplasty can relieve sinus trouble. To view via Windows Media Video (.wmv) - click below.